Apologies for weird lighting in the picture... seems the bright white of that gorgeous cabbage and the reds and purples and oranges and greens around it are at odds with one another. But they all work together on your plate! Part of the fun of getting your veggies from a CSA is not knowing what you're going to get each week. Sometimes you end up with vegetables you wouldn't ordinarily buy, and are thrown into "what do I do with this?" mode. 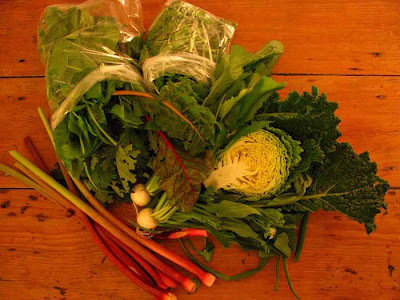 I had never tasted Swiss chard until I started getting it from a CSA share years ago. What did I ever do without it? 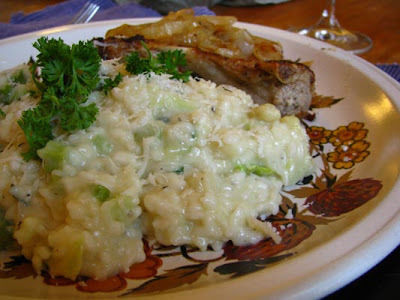 One dish I've been turning to for using up veggies that might not be part of my usual repertoire is risotto. It's nowhere as difficult to make as people might have you believe, so long as you 1) have all your vegetables chopped and ready to go before you start, and 2) can give the risotto 20 minutes of your undivided attention. Other than that, it's all just stirring. Most current cookbooks have a good risotto recipe (or three, or eight); I use Jamie Oliver's recipe here, swapping in whatever relatively sturdy veggies I have around. This batch has fava beans, green beans, garlic scapes, cauliflower, broccoli stalks, and basil (which I added near the end). Big ol' pork chop is optional. Also: if you find that you're not making it through all your delicious kale, there's a great, very detailed tutorial on blanching and freezing the tasty stuff right here. The same method works for turnip greens, beet greens, chard, or any other sturdy braising green. You'll be glad you did it when you dig it out of the freezer come March month! Has it been a whole week already? Look at all the goodness that's been growing all this very hot week at the farm! Your nose probably tipped you off right away to the fact that there's basil in your bag... one of the most wonderful smells there is. ::Garlic, onions and herbs: garlic scapes (flower buds), onion leaves, and a mix of herbs, dill, parsley, and basil. Some of the basil is cinnamon, some lime, and some is good for pesto. ::A bunch of shunguku (edible chrysanthamum for salad) and a surprise tomato or small jalapeno pepper! The tiny bit of flowering on the broccoli shouldn't make a difference to the taste or texture. You can simply cut the flowered bits off if you like. The stems might want peeling (just with a regular potato peeler) before you cook them, but they will still be delicious. If you've never cooked fresh fava beans before, you might not know that the beans inside the pods have to be peeled. This isn't difficult at all, and popping the beans out of their tough skins is actually kind of fun. There's a great step-by-step tutorial here, with beautiful photos. You can add fava beans to soups or stews, puree them in dips, add them to risotto or pasta, or just eat them steamed, as a side dish, with a little butter or olive oil and salt. They're plenty good for you, and tasty indeed. They're great sliced up and served as a side dish - they're a little like garlicky green beans. I like to cut them into 2-inch lengths, blanch them (that is, drop them in some boiling water for a minute, then dunk them in cold water to stop them cooking any further) and add them to an Asian-style noodle salad with some matchstick carrots, green onions, and a sesame oil and rice vinegar dressing. 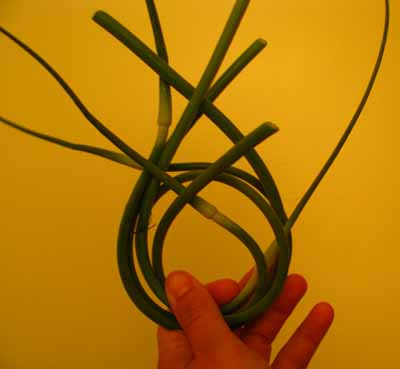 There's some good reading on garlic scapes here, here, and here. Made from S2S veggies! Click the photo to go to the recipe. Welcome to July, Seed to Spoon farm-share friends! So, as I type this up, the weather isn’t exactly hollering, “summer picnic time.” It’s a bummer of a way to start the season. But you know what might make everyone feel better? A big bowl of freshly stir-fried organic veggies, that’s what. Or perhaps a big salad? • the last of the sweet, delicious Hakurai turnips – enjoy them now, because there won’t be any more until next year! • rhubarb – another crop whose time is ticking, so enjoy it while you can! If the bags seem a little light, don’t worry – it’s still very early in the season, and the fields and greenhouses are bursting with growing vegetables that will be making their way home with you in the coming weeks. 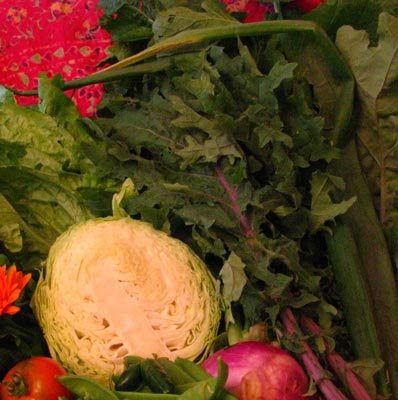 Since it’s still a little wet and chilly out there, maybe you ought to take some of your new tasty veggies and put together a nice grainy salad for some serious fortification. Pick out your favourite whole grains, or combination of grains: maybe barley, bulghar, wheat berries, amaranth, or my top combo, brown rice and quinoa. Cook them according to package instructions to make about 3 cups. If you’re combining grains, cook them separately, or else you might end up with one very mushy grain and one undercooked one. I’d hesitate to call this a recipe, but here’s what I do. Shake this up in a bottle and douse your grains/seeds/raisins liberally. Set the bowl in the fridge to cool completely. Stir to combine, add some more salt and pepper or vinaigrette as desired. Serve over a great tangle of salad greens and enjoy. This salad keeps for days and days in the fridge, so you could just keep munching on it all week. It’s also easily increased if you have a bunch of people to feed. Also, did you know that, in the Mediterranean, spanikopita is usually made with greens that are more like Swiss chard than like spinach? Why not substitute your mixed cooking greens for spinach in your favourite spanikopita recipe? Enjoy your veggies, and see you soon!